Back at the beginning of July KEF opened their first Music Gallery in Central, a stunning spatial experience merging music, art and design. Being a renowned British manufacturer of premium audio products who stand for engineering integrity, design innovation and acoustic quality, KEF wanted to go all out for their Hong Kong flagship and make it a manifestation of their brand and these values. As an overture for the brand, the launch of the showroom represents an important milestone for their development and expansion in Asia, so they collaborated with Conran and Partners, a renowned British design studio to create a space that would be memorable and distinctive. Billy Clarke heads to the Hong Kong district of To Kwa Wan to capture a last glimpse of homes that will be destroyed by the Urban Renewal Authority (URA) next month. The URA ousted almost 380 residents from their homes on Pak Tai Street as part of a redevelopment project, compensating tenants with cash or a flat-for-flat option. We met with the last man standing on a block that will soon be demolished. The workspace of today is undergoing a profound shift. As human living is transformed by the modern need for greater mobility, flexibility and sustainability, a revolution is taking place in attitudes to work environments. There is no denying that social media is now part and parcel of the way many of us work. With recruitment firm Robert Half putting the figure of Hong Kong professionals using LinkedIn at 600,000, the importance of social-networking websites to the business world is only expected to grow. According to leading risk management provider Aon, the continued menace of terrorist attacks and political violence is becoming a threat to global business growth. Its 10th annual Terrorism and Political Violence Map released this year reveals that 44 per cent of countries across the globe have an identifiable risk of terrorist attacks. Although people are the backbone of any business, they are also a key source of risk. A “people risk” is the possibility of a negative event occurring when recruiting, employing and reorganising talent that causes loss to a business. The extent of this risk can differ depending on the company and the country. In an attempt to categorise people risk around the globe, Aon Hewitt has been ranking countries according to their people risk since 2011 in its annual ratings survey. The latest Aon People Risk Index this year has found that Asia-Pacific has the widest deviations in risk of any region worldwide. For example, while Singapore ranked as the second-lowest people-risk city in the world, and Hong Kong the seventh lowest, there were also a number of very high-risk cities such as Chongqing, Hanoi and Phnom Penh. However, there is a lot of economic potential in these riskier cities and there is keen interest to invest in them. Sally Evans, Aon Hewitt’s research manager, adds says that while people risks are lower overall in developed nations, significant risks can still materialise as a result of ageing populations, uneven demographics and restrictive employee practices. Singapore is a perfect case in point. The country has low people risk in regards to demographics, government support, education, talent development and employment practices. Despite this, however, the Singaporean government recently introduced measures to curb the influx of foreign talent which, while not affecting labour pools immediately, has the potential to harm Singapore’s ability to attract talent in the longer term. Hong Kong has slightly higher risks all round, except in demographics. However, it also has issues ahead for future workforce planning, and this is linked to the economy and fluctuating GDP growth. Nevertheless, Hong Kong, unlike Singapore, is currently alleviating the risk of its ageing working population through pro-business immigration policies and high workforce productivity, Evans says. “According to the People Risk Index, Hong Kong is low risk – one out of 10 – for low work productivity. In support of this, a report by the Economist Intelligence Unit rated Hong Kong as the most productive workforce in Asia in 2012,” Evans says. On the other hand, across the border, the mainland’s tight labour market put a lot of mainland cities above the top 50 ranking in the index. There has also been a growing trend of companies shifting to inland, tier-two cities where costs are lower, but risk is higher. Janet De Silva, dean of Ivey Asia, has also witnessed this shift to secondary cities. She says these cities lack trained, informed sales and service staff and, above all, managers. To combat the constricting talent supply, De Silva says that some overseas companies in China are now opening local academies and campuses, while Chinese companies are now offering management salary packages and benefits that match or exceed those offered by multinationals. These actions can lessen risk in the respective locations in which they are carried out. Evans says that education is also another key area where people risk can be improved. Using Hong Kong as an example, she says that the current struggle for parents to find places for their children in Hong Kong schools will have an long-term impact on the quality of “home-grown” talent entering the workforce in the future. This is also true of any developing city that does not address its education supply and people risk correctly. Although it has been a fairly good start to the year for the employment market, not everyone is cooking with gas just yet, as the Hudson Report: Employment Trends for Q1 2013 shows. The report, which surveyed 5,900 employers from four major industries, found that IT&T (information technology and telecommunications) was the only industry with increased positive hiring intentions. On the other side of the coin, hiring intentions dropped seven percentage points in the consumer-business sector, ten points in manufacturing and industrial, and 0.5 points in banking and financial services (banking and financial-services employers also showed the strongest intentions to decrease headcount). Tony Pownall, general manager of Hudson Hong Kong, says that the drop in the consumer-business sector reflects the fact that mainland visitors are not buying as much as they used to. Hiring in IT&T, meanwhile, is being driven by demand from businesses to improve both efficiency and profitability via technology. The outsourcing trend is not just within IT&T. The report also shows that contracting roles are slowly growing in acceptance in Hong Kong, with a third of businesses using contractors more regularly. Pownall says that part of the reason for this is that workloads are up 41.8 per cent compared to a year ago. This is being driven largely by more projects (according to 75.3 per cent of respondents), which naturally lend themselves to contracting support. Good candidates with the right skills, however, are rather thin on the ground. Marc Burrage, regional director of Hays in Hong Kong, says that this shortage is triggering companies to use more flexible staffing tactics, such as looking overseas or outsourcing. The use of these workers is likely to increase even more over the next year as Hong Kong looks set to continue as a candidate-short market, he adds. This shortage goes a long way in explaining another of the Hudson report’s findings – that staff retention is the top HR priority for Hong Kong employers, with 28.4 per cent placing it above all other concerns. “Employers are very aware of the challenges of securing the right talent, which are exacerbated by skills shortages and challenges in securing headcount approvals,” Pownall says. He adds that employers are conscious of the fact that strong employee engagement is the key to staff retention, and a high staff turnover causes disruption and affects productivity. “The right people in the right roles are critical to retaining staff, so giving due consideration to behavioural and motivational fit is important, as these are far more effective indicators of high performance than technical skills,” he says. Pallavi Anand, director of Robert Half Hong Kong, says that she has also observed a fresh emphasis on staff retention recently as a result of companies being at greater risk of losing their best talent to competitors. As time is money in hectic Hong Kong, many cannot go to the gym to lose those extra kilograms gained during executive lunches. If one can’t go to the gym, the gym can come to those who want some exercise – in the comfort of home. A home gym does not occupy as much space as one might think, and it doesn’t have to contain complex equipment. They are easy to customise, based on individual tastes and a reflection of one’s own needs. When setting up a home gym, one should think about space, ventilation, comfortable flooring, music systems, mirrors and washrooms. Some of the most common equipment used in home gyms includes treadmills, a multipurpose bench, squat track, Swiss balls, jump ropes, yoga mats, plus weightlifting equipment such as dumbbells or free weights. Or in the case of Shelly Chan, who is the director of retail operations at a major international hotel in Tsim Sha Tsui, a treadmill will do nicely. Despite her busy work and social life, Chan wants a balanced life, spreading her time between work, family and leisure. Unfortunately, this means other things in life, such as exercise, are often discarded. Chan is determined not to let this state of affairs continue. With no time to go to a gym and even less time to go out and exercise, she has set up her own home workout routine which, thanks to a treadmill and advice from a Life Fitness coach, allows her to keep everything in check. “A home gym has many advantages,” Chan says. “I have two girls in local schools and they have quite a lot of homework. After I come home in the evenings, I need to take care of them and check their homework, so time is quite tight. Chan’s first foray into the fitness world was in the United States several years ago, when she joined a local gym that was a few minutes’ drive from her home. In Hong Kong, gyms are quite different as she found out after joining one for a short while when she moved back here. “If you average it out, a home gym is cheaper than joining a gym and there are other benefits, too,” she says. “Gyms in Hong Kong are too pushy, especially for women. Staff tend to push hard not only for gym memberships, but also for facials, massage and skincare products as well. “A home gym is also very handy because I can take a shower whenever I want without having to wait, and there are fewer distractions at home. At a gym, you might run into somebody you know, but at home I have the option to focus on something else while I am working out, or give it my full concentration,” Chan says. The onus in a home gym should be on ensuring quality equipment, not quantity. She says home gyms are becoming a more popular exercise option among her colleagues and friends. Chan adds that staying healthy is becoming more important the older she gets. “I’ve seen a lot of colleagues who have become sick and I’d like to keep an eye on my health as much as possible,” she says. Ash Wayburne, director of T8 Fitness in Hong Kong, says home gyms are flexible. “There are many options when it comes to working out at home. In Hong Kong, flexibility is key, as everybody has busy schedules. “Being able to do a full body workout at home is a massive benefit. It also means that exercise is always available, and can easily become part of your daily routine. 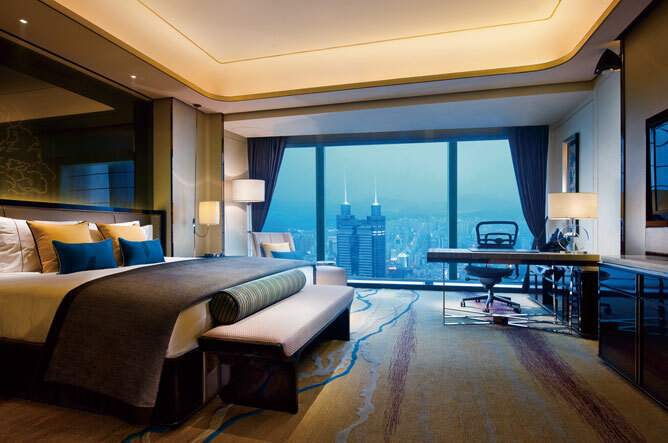 Experience a new level of hospitality at The St. Regis Shenzhen. It has been said that a new skyscraper is built every five days in China. Beijing, as one of the most populous cities in China, definitely has its fair share of super-tall structures. Many of these buildings are located in well-planned business complexes that are more like mini cities, with offices, accommodation, restaurants and shops for the many travellers and workers that the developments are aimed at. A perfect case in point is the China World Summit Wing hotel, one of the capital’s newest luxury accommodation establishments. Managed by Shangri-La and situated in the heart of one of the city’s premier business districts, the property is unmatched in convenience, with plenty of transport links in the immediate vicinity and the Capital International Airport just 45 minutes away by car. Companies in the area span a broad variety of sectors including finance, insurance, trade, telecoms and IT. 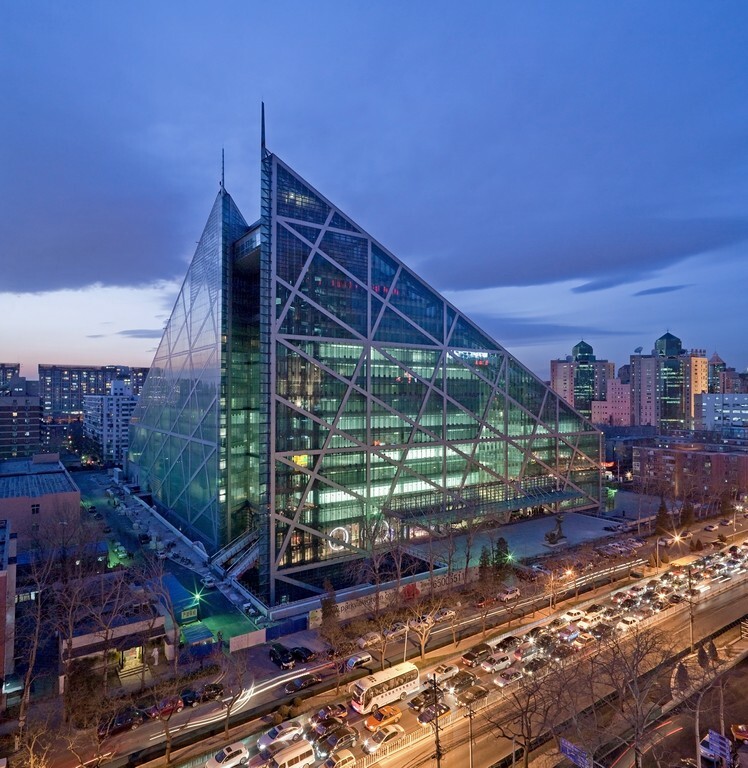 The hotel itself is housed in the upper section of the 330-metre-tall China World Trade Centre Tower, which is the tallest building in Beijing and the 33rd tallest in the world. Inside you’ll find a whole host of facilities, many of which are geared towards corporate events. The more notable facilities on offer include one of city’s largest pillar-less ballrooms, a 95-seat auditorium, a rooftop garden and a number of exquisite dining venues, all offering spectacular city views. Another prominent new opening in the city is the latest Regus Business Centre on the top floors of Parkview Green, a unique pyramid-like structure as accommodating as it is easy to spot. The suites and offices in the business centre offer all the amenities expected from a modern office. Receptionist and secretarial services are also available, as are a number of plush meeting rooms. Both long- and short-term leasing arrangements are available. Welcome to the web portfolio of the Hong Kong writer, photographer, editor and dreamer-creator, Billy Clarke. To navigate use the category headers at the top of this page and scroll down the page to browse the full posts. This is the web portfolio of Billy Clarke, an active media mover in the Asia-Pacific region, he currently contributes to a multitude of publications, periodicals and websites, with a knack for creating tailor-made content capable of enhancing client interest, boosting sales and improving overall shares and views. Services offered include writing, editing, copywriting, photography, photo and video editing, translating, marketing, social media strategizing, and more. of new posts by email.